Have a couple baseline plays that you can run against man-to-man defense and a play or two to run against zone defense. A baseline play with an easy basket can make the difference in a close game. Coach's Clipboard has a number of good baseline out-of-bounds plays that you can use, so check the links below. Here are a couple. 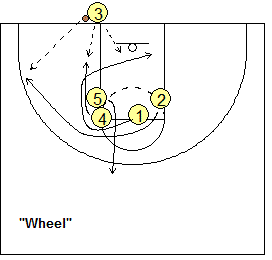 "Wheel" - use this play against man-to-man defense. O1 curls all the way around the stack first looking for the pass and lay-up, and clears to the opposite short corner if no pass occurs. O2 delays slightly after O1, and curls around the stack also, cutting to the ball-side short corner, looking for the pass and shot. After the O1 and O2 cut, O4 slides around O5 into the paint, and O5 then moves out to the point. If the pass goes to the point (O5), O3 should slip into the opposite low post for the quick pass back from O5. After running "Wheel" a couple times, run the "Wheel and Back" option. O1 cuts as usual. O2 fakes the curl-cut, and then makes a quick back-cut to the hoop, looking for the pass and lay-up. "Splitter" - use this play against 2-3 zone defense. Diagram A. Notice that the defense is aligned in a 2-3 zone. O3 has the ball out of bounds. O5 lines up above the blocks, between the X4 and X5 defenders. O4 stacks outside the X1 defender. O1 and O2 form a mini-stack above the X1 defender. When O3 yells "go", O5 seals the inside defender. 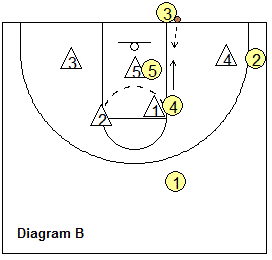 O2 (your best shooter) cuts around O4's screen to the ball-side corner. O2 could get the pass here and the three-point shot. 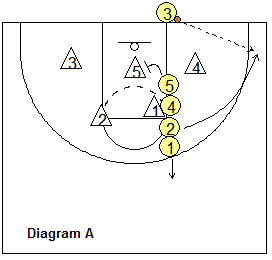 Now if the X4 defender to moves out toward the corner, O4 slides down the lane into the gap looking for the pass and shot (Diagram B). You should have a 2-on-1 situation with the X4 defender. Either O2 or O4 should be open.